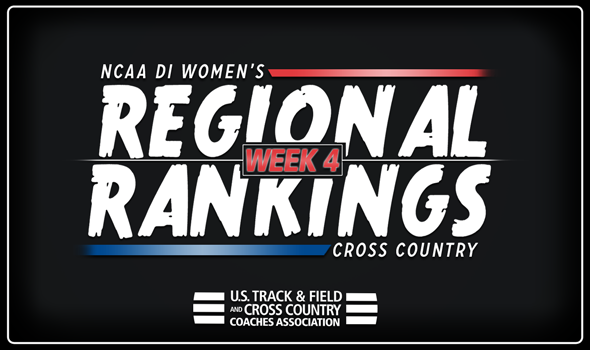 NEW ORLEANS – After one of the biggest weekends in the sport this season there was great shake up to the newest NCAA Division I Women’s Cross Country Regional Rankings that were released on Monday by the U.S. Track & Field and Cross Country Coaches Association (USTFCCCA). Big changes were expected and that is exactly what happened with some of the top teams in the country doing battle at the Wisconsin Nuttycombe Invitational, the Louisville Classic, the Roy Griak Invitational and the Joe Piane Invitational, among other meets this past weekend. Every top-five of the nine regions saw movement this week which included the crowning of new No. 1’s in the Mountain, Northeast and West Regions. See below for more information on who were named the new No.1 teams along with the complete rankings including overviews of each region as well as the full top-15 lists of each region at the bottom of the post. The top-two teams in each region automatically advance to the NCAA Division I Cross Country Championships. Wisconsin looks like the team to beat in the Great Lakes Region as the Badgers finished an impressive sixth-place at its Nuttycombe Invitational this past weekend to hold onto the No. 1 ranking. The unit was led by Alicia Monson who became the first Badger in Nuttycombe history to win the individual title for the host team. It is the fifth consecutive week that Wisconsin has held the top spot in the region to open the season. Slotting behind them in No. 2 in Michigan who took home the championship at the Louisville Classic. The Wolverines placed three athletes inside the top-10 and six inside the top-20, led by Avery Evenson’s fifth-place finish. Improving one spot to No. 3 is Indiana who finished seventh at Nuttycombe. The team was was led by Maggie Allen who placed 18th overall. Trading spots with the Hoosiers is No. 4 Michigan State who came in eighth at Nuttycombe. Erin McDonald was the top Spartan finisher in 33rd. Completing the top-five is No. 5 Notre Dame who finished fourth at its Joe Piane Invitational. The group was led by a third-place finish by Anna Rohrer. Penn State comes in at No. 2 after they finished 13th at Nuttycombe. Freshman Julia Paternain was the top finishers for the Nittany Lions with a 30th-place showing. Slotting in at No. 3 is Princeton who improves one spot from its previous ranking. The Tigers won the Loyola Lakefront Invitational with a team score of 65 points. Melia Chittenden finished fourth overall to led the group who also had two runners compete at the Paul Short Invitational. Swapping spots with Princeton is No. 4 Georgetown who came in 25th at Nuttycombe. The group was led by Paige Hofstad’s 32nd-place finish. Rounding out the top spot was No. 5 Penn who took 11th at the Paul Short invitational. The Quakers top finisher was Maddie Villalba who came in 18th overall. Iowa State was named the No. 1 team in the region for the fifth-straight week to open the year. The Cyclones finished ninth at Nuttycombe, led by Cailie Logue in 21st. The group finished ahead of ranked teams in NC State and Penn State at the meet and should see a jump in the national rankings as well. The No. 2 spot is held by Minnesota who won its Roy Griak Invitational with a 52-point performance. Bethany Hasz won the individual crown to lead the Gophers and her sister Megan finished right behind her in second by just seconds. Holding the No. 3 spot is Oklahoma State after a 15th-place finish at Nuttycombe. The group was led by Sinclaire Johnson who finished 15th overall as an individual. Improving one spot from their previous ranking is No. 4 Northwestern after the program placed sixth at the Joe Piane Invitational. The top finish for the Wildcats belonged to Aubrey Roberts who came in sixth individually. Rounding out the top-five is No. 5 South Dakota after the program placed third at the Roy Griak Invitational. Megan Billington was the top performer for the Coyotes with a 10th-place showing. There’s a new No. 1 in the Mountain Region as Colorado takes the top spot for the first time this season after the Buffaloes collected the title at Nuttycombe with an 80-point victory. Colorado finished 11 points higher than the second-place team at the meet and were led by Dani Jones who came in fourth-overall as an individual. Dropping one to No. 2 is New Mexico as the reigning national champions could not defend their Nuttycombe title this past weekend despite a strong effort. The Lady Lobos placed three in the top-10 at the meet led by Weini Kelati’s runner-up finish. No. 3 remains with BYU after the program won the Joe Piane Invitational with a 37 points. The Cougars were led by individual champion Erica Birk and placed three in the top-five of the meet. Utah State keeps the No. 4 spot after a third-place showing at the Paul Short Invitational. Alyssa Snyder led the way for the unit with a third-place finish. Utah stays at No. 5 in the region. The Utes were off from competition this past weekend. Columbia is the new No. 1 in the Northeast Region for the first time in school history after the unit finished 11th at Nuttycombe, led by a 43rd-place finish by Allie Hays. The Lions knocked off five nationally-ranked schools and had the highest finish in the region at the prestigious meet. Yale improved four spots to take No. 2 after they won the Paul Short Invitational. Andrea Masterson was the top finisher for the program in fourth overall. The mark ties the school record for highest rank in the poll received in history. The top-five was rounded out by No. 3 Dartmouth, No. 4 Brown and No. 5 Syracuse, all of whom were off from competition this past weekend. The No. 1 spot in the region belongs to Ole Miss for the second consecutive week. The Rebels were off this weekend after picking up the victory at the Battle in Beantown two weekends ago. Ole Miss will be back on the course with the running of Pre-Nationals on October 13. No. 2 belongs to Florida State who improves two spots after the team knocked off two-nationally ranked teams to finish third overall at the Joe Piane Invitational. The Seminoles were paced by Militsa Mircheva’s 10th-place finish and placed five runners in the top-37 of the meet. Georgia Tech comes in at No. 3 after being off from competition this past weekend. They return with the running of the Penn State National Open on October 12. No. 4 is claimed by Georgia after the Lady Bulldogs took second overall at the Paul Short Run. Jessica Drop led the group for the second-straight meet as she collected a second-place finish. Vanderbilt moves into the top-five for the first time this season after a two-spot improvement from the previous rankings. The Commodores finished 24th as a team at Nuttycombe. Arkansas remains the top team in the South Central for the fifth-straight week to open the year after the Razorbacks recorded a fifth-place finish at Nuttycombe. The top performance belonged to Katrina Robinson who came in eighth. SMU moves up one spot to No. 2 after the Mustangs placed third at the Louisville Classic. The unit was led by a fourth-place finish by Hannah Miller. Dropping one spot to No. 3 is Texas who came in 23rd as a team at Nuttycombe. The Longhorns were led by Destiny Collins who finished in 39th. Moving up one spot to No. 4 is Texas A&M who took ninth at the Loyola Lakefront Invitational. Also improving one to move back into the top-five is TCU after the unit finished 32nd at Nuttycombe. Taking the No. 1 spot in the Southeast is NC State after the group finished 10th at Nuttycombe in its opening-season meet. Elly Henes was the top finisher for the Wolfpack in 23rd. Also standing pat was No. 2 Furman after a second-place finish at the Joe Piane Invitational. The Paladins placed all five scoring athletes in the top-29 of the meet and were led by Savannah Carnahan who finished fourth as an individual. Improving two spots is No. 3 Duke after a fifth-place showing at the Joe Piane Invitational. The Blue Devils were led by Michaela Reinhart who finished 23rd. No. 4 remains with Wake Forest who was off from competition this weekend. While the men’s program did compete at the Paul Short Invitational, the women will not compete again until the Winthrop Invitational on October 5. Staying in the top-five is Virginia Tech who takes the No. 5 spot. The Hookies came in fifth at the Paul Short Run and were led by Lauren Berman who came in 12th overall. Boise State took a hold of the No. 1 spot in the West Region for the first time this year as the Broncos recorded another impressive performance. Boise State placed second overall at Nuttycombe as the team had three top-10 finishers in Allie Ostrander (fifth), Emily Venters (ninth) and Clare O’Brien (10th). Remaining in No. 2 is Oregon who off from competition after winning the Bill Dellinger Invitational two weekends ago. The Ducks will next compete at Pre-Nationals on Oct 13. Falling two spots to No. 3 is Stanford after the Cardinal won its Stanford Invitational. To go with the team-title, Elise Cranny also recorded the individual victory for the program. No. 4 remains with Washington after a third-place finish at the Stanford Invitational. Katie Rainsberger was the top finisher for the Huskies as she was the individual runner up at the meet. Making up the rest of the top-five was No. 5 Portland who improves one spot in the rankings after a fifth-place finish at the Willamette Invite. It is the first time the Pilots have appeared in the region’s top-five this season.